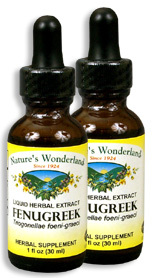 Fenugreek Extract, 1 fl oz / 30 ml each (Nature's Wonderland) - Penn Herb Co. Ltd.
What's old is new again! Such is the case with Fenugreek, one of the world's oldest herbs. Current studies reveal the high fiber seeds have a positive effect on modern ills - they're shown to support healthy blood sugar and cholesterol levels. Fenugreek has been used medicinally as early as 1500 BCE and is an important herb in Middle Eastern, Ayurvedic, Siddha, and Unani healing cultures. It continues to be a traditional favorite for maximizing healthy breathing and for encouraging healthy digestive function (one herbal guide suggests a cup of Fenugreek tea after high fat meals to help with digestion and fat metabolism). Could Fenugreek be the important first step in your daily health routine? COMMON NAMES: Alholva, Bird's Foot, Chandrika (Sanskrit), Fenegriek, Foenum Graecum, Greek Hay Seed, Hu Lu Pa, Medhika (Sanskrit). AMOUNT PER SERVING (333mg/ml or 30 drops): Certified Organic Fenugreek (Trigonella foeni-graeci). OTHER INGREDIENTS: Grain Alcohol (20-30% by volume), Deionized Water. Free of: milk, dairy, egg, fish, shellfish, tree nuts, peanuts, wheat, gluten or soy. Maintains healthy lung & bronchial function; soothes the throat; bowel support; promotes healthy milk production; menopausal support (promotes positive mood, hot flashes); anti-cellulite support. 20-40 drops in water or juice, 2-3 times daily or as needed. DO NOT TAKE DURING PREGNANCY. Shake well before using.